Verizon Wireless has officially announced the launch of its newest 4G LTE smartphone which is named as LG Revolution, scheduled to hit Verizon stores on May 26 for $249.99 on a new 2-year service agreement. 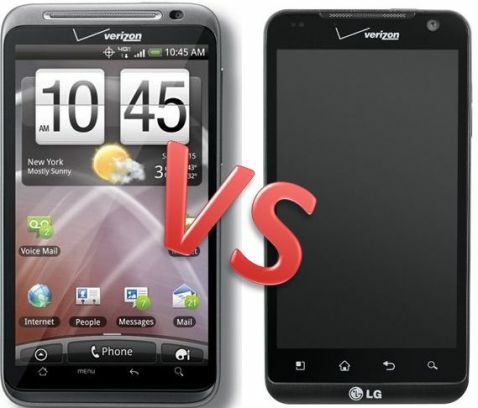 Besides, HTC Thunderbolt is also the 4G LTE-enabled phone which carries the same subsidized price tag as LG Revolution. For folks who like to experience Verizon’s blazing-fast 4G LTE network and wanna know the differences between both smartphones to help in consideration when purchasing either LG Revolution or HTC Thunderbolt LTE smartphone, here is a simple comparative table of HTC Thunderbolt vs LG Revolution with specs and features comparison at a glance. From the table above, you can easily found that both of the Android-powered contenders’ specifications are almost similar except the slightly differences in RAM, battery, dimensions, weight and camera. As HTC Thunderbolt features higher-resolution camera, larger RAM, lighter weight, and slimmer body than LG Revolution, but the Revolution packs stronger battery compared to the Thunderbolt. For me, one of the most notable features of LG Revolution is the Neflix application that allows for easy accessing to movies and TV shows right on the phone while on-the-go, which comes pre-included, ahtough everybody can download Netflix app from Android Market anyway. So, the choices is based on your personal taste, needs and interest.